Compared to the Basking Shark, all the other species of shark look like tiny midgets, but despite its size, the Basking Shark is a peaceful and unprotected water creature. 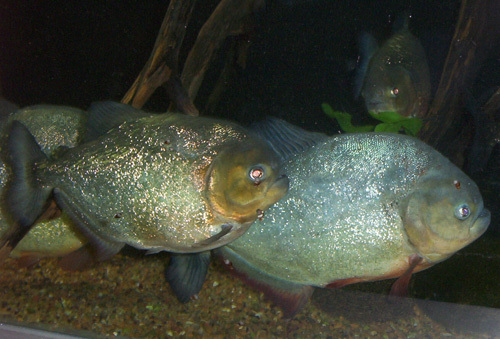 They inhabit waters of moderate temperatures all around the world, where it spends most of its time swimming through the waters and feeding on plankton and other small water creatures. Sharks have been a subject to prejudice and people think of them as bloodthirsty predators, but in fact the two largest species of sharks – the whale shark and the Basking Shark are peaceful plankton-eaters. 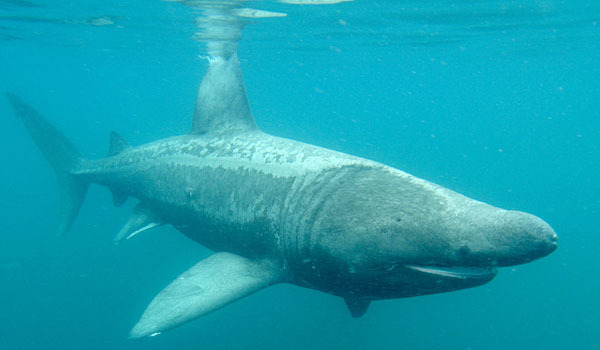 The Basking Shark can reach a length of 15 metres and weigh as much as 4 tons. They live alone or sometimes in groups of 2-3 individuals, and spend most of their time slowly swimming through oceans and seas, filtering amazing amounts of water to capture plankton in their mouth. These sharks can often be seen near the surface of the water where plankton is abundant and therefore some fishermen call it “sunfish”. 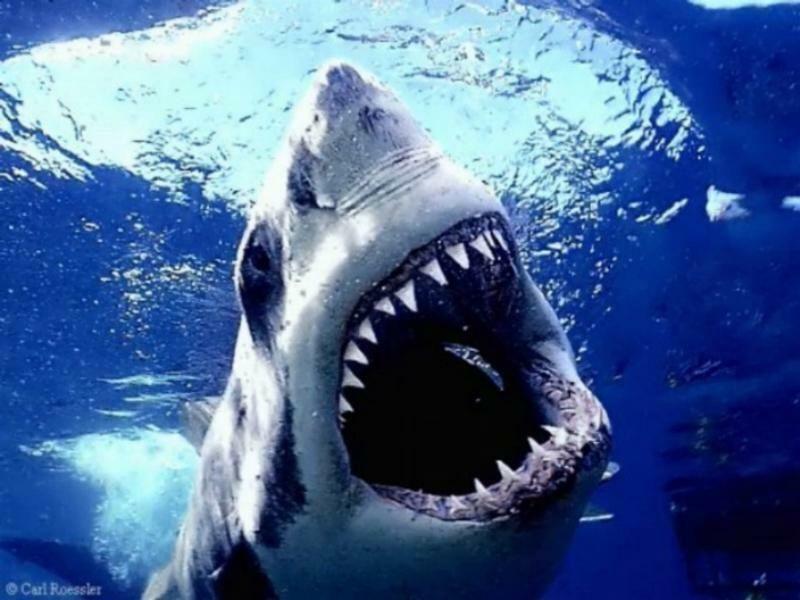 In the winter, when food is scarce, the shark descends to the bottom of the sea or ocean and stays there until more food is available. Sharks that live in European waters even lose their water filtering tools which regrow when the winter is over. There are not enough reliable sources to draw definite conclusions about the mating habits of the Basking Shark. Scientists have, however, discovered a rather interesting fact, that these sharks are unique by the amount of eggs they produce – more than 6 million eggs have been found in some captured females, which is a lot more than any other shark would produce. It is speculated that eggs hatch inside the female’s body, as it is for all other sharks. Only two to three pups are born per litter, so the large amount of eggs inside the female’s body might serve feeding purposes for the pups. The gestation period is very long – up to 3 years, and almost fully-developed sharks are born. Upon birth they are about 1,5 metres long and they soon leave the mother. 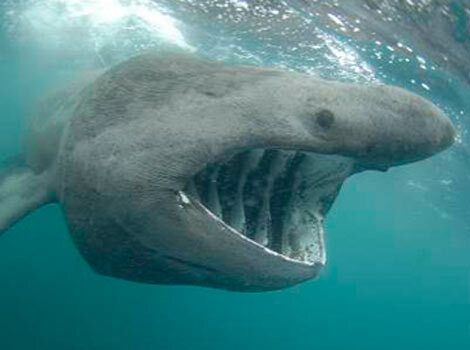 Sexual maturity is reached after 3-4 years, but the total life expectancy of Basking Sharks is unknown. There is no precise data about the population of Basking Sharks. They have never been commercially fished, thus humans haven’t caused any direct damage to this species, although as for all large sea creatures, fisherman nets pose a serious threat to these sharks. Hopefully, we will not see these enormous, yet peaceful sea creatures become extinct. Aww, it’s adorable for a shark! I’ve always wanted to swim with a whale shark or one of these, too bad I can’t find such a location..